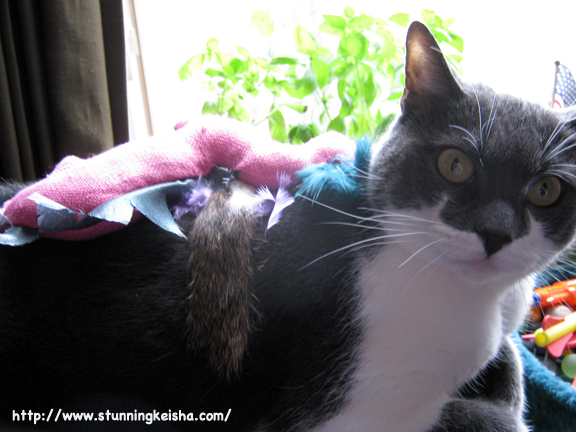 Stunning Keisha: Wednesday Word of the Week—Dinosaurs! CK: Hear that? It the telephone. Answer it, Woman! TW: Hello? Hi Rick. There's a package at the front desk? I'll be down to pick it up! Thanks! CK: That better be for me cos I'm expecting a lot of stuff! TW: Hi Gustavo. I take it you have something for Cathy Keisha? I know it can't be for us. Gus: She gets ALL the mail! Ha ha! She must be some cat! TW: Your toys from Tiny Pearl Cat (that I won in Marg's auction for Mini) came. I'll open it after I put the groceries away. We bought you more Fancy Feast. She finally opened my package. I sniffed. I went nutz! I rubbed all over my new nip dinosaurs. I rubbed some more. I bit! I kicked! And guess what? You're gonna have to take my word for it cos none of this was documented on film. She gave some lame excuse about the table being too cluttered or something. She sez she didn't want to scare me away from my new toys since I rarely play with nip toys. Oh, eventually she did get out the camera to take a video of me in action but … I BOLTED!!! Bwaaahahaaa! What choo doin' Woman? That's right, place the toys on my back. No one will know this is your lame attempt to get me to pose. rabbit fur! It's as soft as me (not that I condone killing animals for their fur)." Now through the magic of Photoshop, I never have to go through the torture of posing with stuff again. I can be placed anywhere in the world without actually being there! I think I like this Photoshop stuff. On top is the overexposed picture of me with the dinosaurs laying on my back; on the bottom is the Photoshopped picture of me admiring my new toys. I look like I'm doing a print advert for Pearl's Field of Zoooms catnip! Is it real or is it Memorex! We want to thank Glogirly for making my eyes look right in the bottom picture. Woman, maybe the Word of the Week should be Photoshop! The Nip Dinosaurs look´s great , maybe even I would play with them that doesn´t like Nip that much ?? I wish my mom had Photoshop on her computer !! We all seems to get ameowzing gifts these days. Yous is bootiful, but ours is incredibiliciously splendidly gorgeous. Mario said his toys were so enticing his M could hardly get them settled in the house...even thru the wrappings! Those dinosaurs look terrific! WE've heard that Tine Pearl Cat's nip is primo! OMC! 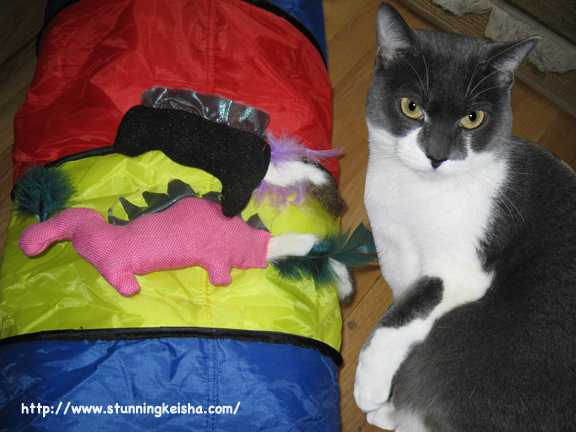 Seriously, Nip Dinosaurs? With tails even? Oh, you look like you're having so much fun that we want some of these too! Our Person is trying to learn Photoshop but not getting very far. She is determined to learn how to do it. Glad you got your toys already. That is terrific.They look really nice. Sorry TW was so late getting you your grub, it happens to us too. So. Do dinosaurs taste like chikkun? Dino nip , nice one. Enjoy Keisha and have fun. Wonderful Wednesday to you. Tuna tasting dinosaurs would be real cool! My human knows Photoshop. And she STILL makes me pose! Is that criminal or what!? I tell you - that Tiny Pearl's NIP is the BEST EVER. It's even better than SilverVine, although Silver vine is a close second. I went nuts for it. You always look your best CK, photoshop or not! Cool toys though! Wow! Awesome Nip-a-saurus ! the Momma is just starting to learn Gimp so maybe we can not have to pose all the time, she can just use us over again! The word of EVERY week over here is Photoshop! haha! And for the record, the cameras never work when the table is cluttered. Ours won't even work if the bed's not made. Those dinosaurs look awesome - enjoy! Those dinosaurs look fun, CK! Our mom is too lame to learn photoshop so we're forced to pose with stuff. But that doesn't mean we hafta cooperate. Ohh, your dinos look like lots of fun! Those authentic tails would get a lot of drools at our house! Our mom is experimenting with Photo shop now, too. Kind of reminds our mom of the old commercial question, "does she or doesn't she?" Makes us wonder who's photoshopped and who isn't. We agree with Katie. Mom Forbids the camera from use when the house isn't tidy (MOL) Silly humans. DINOS though? We gonna hafta consider those if YOU like them! Those Nip Saurs look great! CK this photshop is pawsome no more posing unless you decree and the human still gets to put stuff on you for some cool reactions.